Performing a weekly dog checkup on your Miniature Schnauzer is one of the best ways to catch minor problems before they turn into major ones. And it only takes a few minutes of your time and easy to do. Just print out our dog health chart below; set aside about 10 minutes of time when your dog is calm and relaxed; and then go through each item on the list. 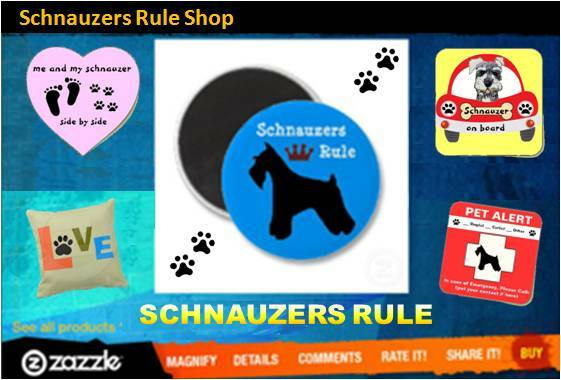 Using our simple guide give your Schnauzer a check or 1 point every time he scores GOOD in a category. Is Your Mini Schnauzer a Perfect 10? If not, consult with your Vet on any areas of major concern or problems you noticed. And for smaller concerns or where improvements could be made, read through our dog tips and health articles right here on Schnauzers Rule to help your Miniature Schnauzer thrive! dog health tip: If you ever have any concerns about your Miniature Schnauzer's well-being, always seek medical attention and advice from your Veterinarian! 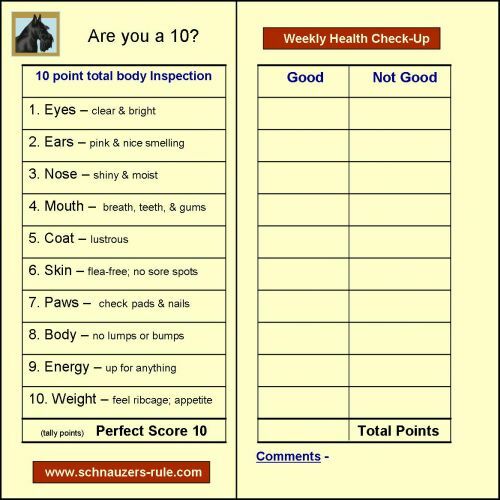 Click here: At-Home Dog Wellness Exam to print out the checklist so you can chart your own dog's health. Clicking on the link will open up a new window in a PDF document. Just click on the print icon to make a copy. Performing a weekly dog checkup takes only a few minutes to do. It provides extra time for you to bond further with your Miniature Schnauzer and more importantly helps you become better aware and very familiar with what is normal for your dog. This makes it a lot easier to detect when something is not right sooner. And early detection is the key to battling any dog illness. Don't wait for your dog's annual veterinary checkup. Monitor your dog's health at home and address any concerns your vet right away! Below is detail information about each check point and what you are looking for when performing your dog's checkup at home. As you become more familiar with the process and information, the easier it will be. 1. Dog Eyes – Your Miniature Schnauzer's eyes should be bright and clear. There should be no thick discharge emitting from the eyes or excessive tearing. (Further reading: dog eye problems). 3. Miniature Schnauzer's Paws – It’s good to check your your Miniature Schnauzer’s paws often. After every long walk or outdoor play activity, do a quick check of your dog's paws and pads for any damage that could have occurred. Also, keep your dog nails trimmed and filed smooth. This will prevent many of the problems that dogs with nails that have gotten too long encounter ( snagging, tearing, ripping...). 4. Dog's Nose – Your Miniature Schnauzer's nose should be shiny, cool & moist to the touch, most of the time. But if your dog's nose is warm and dry, don't panic. It could be the time of day, temperatures, or the recent activity of the dog causing the physical fluctuation. 5. Dog's Teeth and Mouth – Your Miniature Schnauzer should have fresh breath. A dog with really bad breath odors indicate there's a problem. Your dog's gums should be a healthy shade of pink and there should be no signs of bleeding. If you haven't done so yet, begin brushing your dogs teeth daily. Good oral hygiene care is so important to our Schnauzers. 6. Schnauzer's Energy Level – Miniature Schnauzer's are energetic little pups. Your Miniature Schnauzer should have good energy and be able to move around freely with no physical signs of any pain in his legs or joints. A less active dog might be a sign he's not feeling too well. In this case, it might be a good idea to take a trip to see the vet and have your dog checked out. 7. Dog's Appetite – Your dog should be ready to eat at meal times. This usually isn't a problem for Mini Schnauzers as they love to eat. A word of caution though: they do have a tendency to put on weight, so monitor your Schnauzer's food intake and weight closely. A dog that shows a lack in appetite indicates there's something wrong. 8. Miniature Schnauzer's Weight – Feel around your Miniature Schnauzer’s body with both hands. You should be able to feel your Miniature Schnauzer's ribcage. If not, your Miniature Schnauzer could probably stand to drop some weight. (See incorporating an exercise regimen for you dog.) If on the other hand, your dog's ribs are very pronounced, it's a sign that your dog may need to gain a pound or two. Ask your veterinarian what a healthy weight for your dog should be. 9. Miniature Schnauzer's Body – Slowly rub all around your Miniature Schnauzer’s body, the legs, and gently around your dog's head as well as under his neck. You are feeling for any unusual lumps or bumps on your dog that may need attention. 10. Dog's Ears – During your at-home dog checkup smell your dog's ears. Do they smell nice? If not, that could mean yeast is growing or some other issue is occurring. There should be no visible signs of discharge from your Miniature Schnauzer's ears. His ears should be a healthy pink color. Your dog should not display any excessive scratching or shaking of his head. Keep your dog's ears cleaned and be sure to remove any excessive inner ear canal hair, to reduce infection. The 10 item checklist above is a great way to keep on top of your Schnauzer's overall health. End the anxiety of dog care by learning how to deal with with minor dog health problems before they become big ones, right here on Schnauzers Rule. Knowledge Share... If you found the above article and health checklist for dogs helpful and informative, please share it with your dog-loving friends by clicking on one of the share links (like facebook, twitter, and google +1) located at the top right or bottom of this page.